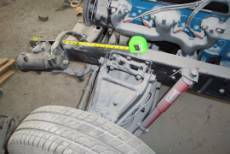 system is identical except for the fact that coil springs are used instead of torsion bars. After looking over my truck and making a list of what parts I will need or ideas of what parts I can use, I went to the wrecking yard to look and to see what just might work. unit. The suspension was set up with original manual steering components and drum breaks which I plan to change. I ordered the disc brake conversion kit from Chevy Duty for my 1963 spindles and reused the mounting bracket that came with Chevy Dutys 1947-54 Chevy truck power steering kit, witch I used with my original stock suspension, and relocated it up front on the frame rail as described later. Im using a 1972 Saginaw power steering box off a Chevy 1/2 ton truck. This is what I originally had when I was using the with Chevy Duty 1947-54 Chevy truck power steering kit. Before you go any farther you will need to remove a few things from the frame. These include the front and rear spring hangers, shock mounts and brake line bracket (see drawing left). I then measured and marked the frame rail starting at the leading edge back 21 inches to where the forward upper A-arm bolt goes (see photos below). This mark is my centering mark to mount the cross member. At this point I decided to bolt the cross member directly to the frame instead of using the two 1 spacers. I figure this would help in my overall track width. The original track width of the front axle is 58 ½ inches from hub to hub. The 1963 IFS track width is 63 13/16 inches, about 5 ½ inches wider than the original. Most likely if you use this set up with or without the 1 spacers, you will have to use some type of reverse offset wheel to keep the tire in the wheel well. I took the crossmember to a local machine shop and had them take out around 1 5/8″ (I dont remember the exact measurement but this is what comes to mind.) out of the center with a plasma cutter. I waited as they did this and it took about 15-20 minutes for both cuts. I then drilled a bunch of holes near the new cuts on both halves of the crossmember. Next, one of the halves was plated on the inside using a plug weld method. 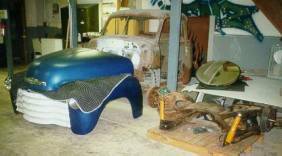 Once completed, the other half was shoehorn over the plated half and then installed the unit on the frame for fit. I have found that doing this step with the frame upside down is much easier than right side up. All the weight of the cross member is resting on the frame and not on jacks holding the cross member up. Once both halves are aligned on the frame rails using the 21 inch mark, you can mark and drill the mounting holes. I then bolted both halves to the frame rails and synched the halves together and plug welded the other half to the plates as before. Once both sides are welded in this manner, all of the welds were ground smooth. I then added some more plates to the outer surface for extra strength. If you do this right, it just might look like a factory job. Just a note, once you have welded the cross member back together as one piece, you will need to unbolt it from the frame rails and move it to the side so that holes can be drilled for the upper A-arm shim-bolts that connects to the A-arm shaft assembly. When both holes on either side are drilled out, the cross member can be reinstalled. As mentioned before I eyeballed were I thought the steering box and idler arm should be. This is where I made my big mistake. For those of you who have been following my instructions, Im sorry. My entire steering geometry is wrong causing severe bump steer. Bump steer is when the wheel moves in and out as the suspension travels up and down. What I should have done was to make a template off the original frame in relation to the cross-member mounting holes and the steering box and idler arm holes. This would have made life much easier for me. I didn’t have an original frame to use as reference and that is why I eyeballed the linkage locations. This ended up being a very costly mistake on my part. By using a template for this you should have the same steering characteristics as the 1963-87 Chevy truck did. 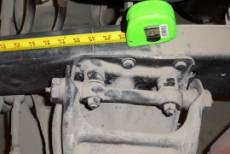 The second thing you have to do is to make sure that the pitman arm and idler arm are parallel after they are mounted on the frame. It may be necessary to shorten the center link to make this work. 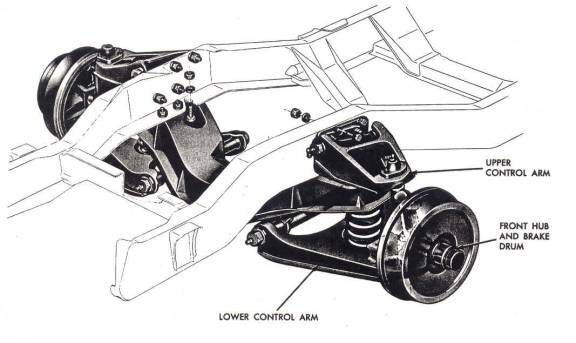 If you plan to use power steering as I did, you need to use 1969 or later power steering center link, tie rods, idler arm and pitman arm as these components are heavier duty than those used in manual steering trucks. One of the most asked questions I get is why I narrowed the frame. I dont like spacers. Plus, narrowing the frame takes off an inch or so off each side in overall track width. I have a set of 1990s S-10 wheels that I like and wanted to use on this truck. The wheels are 15 X 7s with a 4 inch back spacing. In other words these tires are wide compared to the originals. The 1963-87 suspension is much wider that the original 1947-55 1st series is. I narrowed the crossmember in hopes to narrow the overall track width just enough to get the wheels and tires within the fenders. This didnt happen. What this did is to cause my tires to stick outside of the wheel well just over an inch on either side. This wasnt the look I was going for. So, how am I going to reduce track width even more? I had two choices. Change out all my wheels and go with custom offsets and widths or try to find someone to build custom rotors. Either one would most likely work. I still want to keep the S-10 wheel as I am using 8 of them, my truck with side mount spare tire and matching utility trailer with side mount spare tire. As for the custom rotors Im guessing they would be very expensive and I couldnt fine anyone that does that sort of thing. I know this is done for other applications and have even asked around at SEMA the 2 years I attended. not happy with my results. Should you have any questions feel free to call or e-mail me. I will try to answer all questions. Again, I never finished my suspension install and ended up selling it. Currently there are no commercially made aftermarket IFS out that will give stock height. Most all aftermarket IFS will drop your ride height 3-4 inches right off. I didn’t want that. As for the last comment, I just found a guy that has built a crossmember to fit the 1947-55 1st series trucks and uses GM metric G body/S-10 suspension components. The track width is within a half inch of the stock width and the ride height is an inch less of original. The person who designed this is Scott Danforth. Here is some info he has passed on to me in his email. You can also find this info on the stovebolt.com forum. Here is the link to the forum http://www.stovebolt.com/ubbthreads/ubbthreads.php?ubb=showflat&Main=46889&Number=338344#Post338344. You can also find progress photos at http://good-times.webshots.com/album/562699262CfcAqj. This is what you get. The cross member includes boxing plates for the frame that go from the current front radiator cross member back to the transmission cross member. 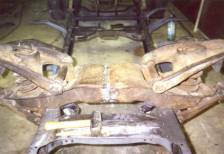 The IFS crossmember takes about 3 hours of cutting and welding after you have the stock front suspension out of it. Donor cars can be any GM Metric (78-87 G-body, 82-04 S-series) The G-bodied cars have M12 bolts in both lower A-arm bushings, while the S-10 changed from M12 early to both M12 and M14 later. My instructions cover this. Aftermarket A-arms are available for those that want to run tubular a-arms. If you get A-arms from Global West, let them know that you need the ones off the good jig. Apparently one of their jigs is bad and they have sent bad parts out (their story to one of my customers – covered on the stovebolt forum) A-arms are cheaper for the G-bodied cars than the S-10 Trucks for the same parts. 2 stuff from Flamming River will also work, however looks a little light. The price is similar to the Mustang 2 weld in prices. From time to time I run a special for stovebolt members. I have these made 5 at a time and currently have one kit in stock, however I think the boxing plates that I have in stock are the early revision. If that is the case, I would reduce the overall price by $30. They work, just require a bit more weld time on the bottom because there is a 5″ long gap that needs to be welded (you can see the larger weld bead in a few of the photos). The new revision fits much better (measure twice, cut once  I miss measured the bottom of the frame). When that goes, it takes 3 weeks for my fabricator in Green Bay to make another 5. I ship UPS and can ship freight collect to a UPS account. Shipping to a commercial address is less than shipping to a residential address. I use UPS.com for obtaining prices and is pretty close to what I actually pay (sometimes more, sometimes less) I dont make money on shipping. I would like to thank all those who have called me over the years asking questions about this conversion. I just recently stumbled across a forum and found that this conversion is referred to as the Andereggen/Joyce IFS conversion. I couldnt believe it. I have spoke to others who have done this conversion and will try to get some photos of their vehicles with contact info posted here. I will also try to get my photos in the gallery larger so that you can see detail.